What is Chef? Technically, Chef is both a company and an automation platform for working with your infrastructure in the cloud, on-premises, and in hybrid environments. Chef has lots of components, but this article will focus on cookbooks. The cookbook is the fundamental building block of Chef. It is used to define what you’re going to do to automate a task. A cookbook contains recipes that are the actual scripts. Recipes can accomplish very simple tasks, such as installing or uninstalling software, or they can be used to perform more complex tasks, such as assembling and configuring multiple software components across your network so they all work together. Listing 2 shows how the recipe would look if your domain for ArcGIS Server is yosemite.esri.com, your admin_username is smokey1, and your admin_password is onlyUcan4527. Listing 4 shows how you would modify the webgis-windows.json file. 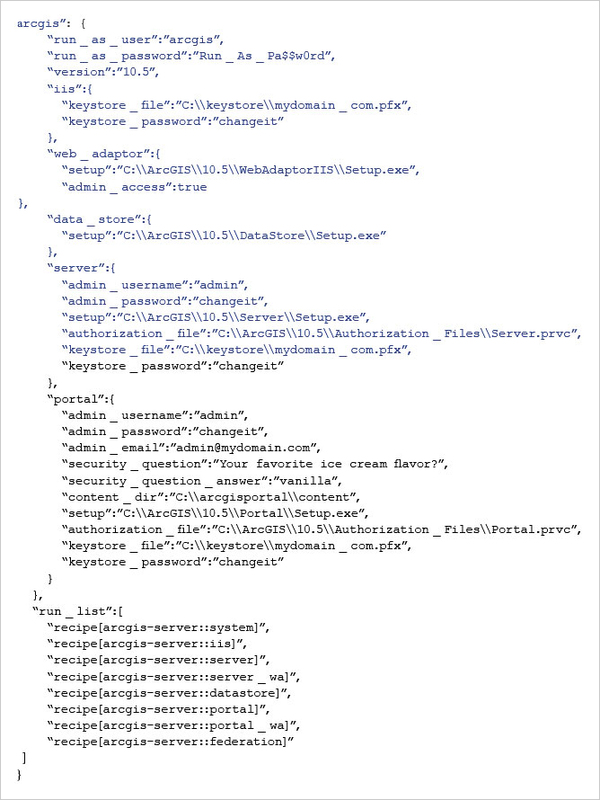 You provide the version of your software, the path to your keystore, the keystore_file, keystore_password, and the correct pth to your setup and authorization files. The setup and valid authorization files for the ArcGIS software stored in a folder on the machine you’re working with. An SSL certificate issued by the certification authority for the domain. (Note: If you don’t define a CA-cert, this tool will generate and use a self-signed certificate for testing purposes.) Note that self-signed certificates are not supported by Portal for ArcGIS. Your organization probably already uses CA-signed certificates from an organization like Verisign, Thawte, or DigiCert, and a web server expert in your IT staff can help you acquire a signed certificate. The Chef Client to run recipes. You can download and install the Chef Client appropriate for the operating system you’re working with. ArcGIS Cookbooks were designed so you don’t have to write scripts—just modify existing recipes and files to automate simple tasks. The listings that accompany this article demonstrate how easily you can modify and use recipes. 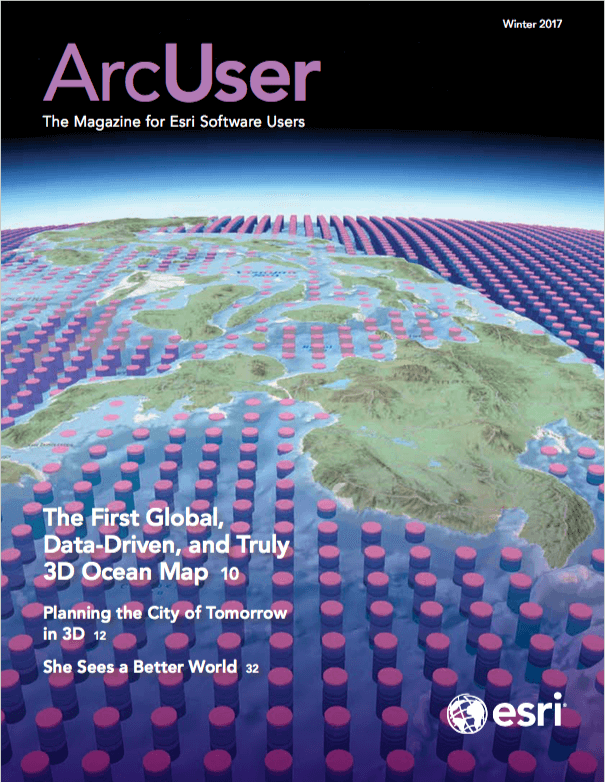 Listings 1 to 4 show how to use an ArcGIS Cookbook recipe to federate an ArcGIS Server with Portal for ArcGIS, a task you can do manually but one that can be automated with Chef. 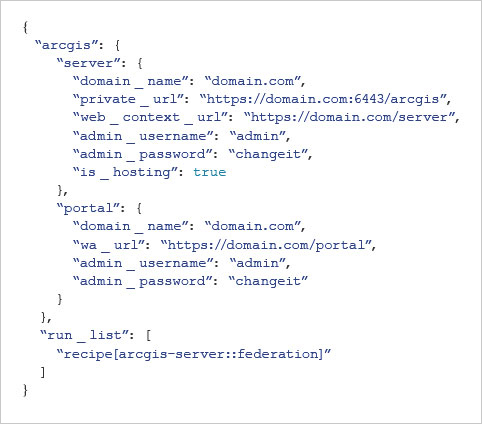 You can use this recipe not only for your initial configuration but later when you have added another ArcGIS Server to your deployment. After making changes to the recipe and saving them, use the Chef Client you installed to run the script by typing “chef-solo -j C:\chef\roles\webgis-windows.json” at the prompt (C:\) in the command prompt window and pressing Return. 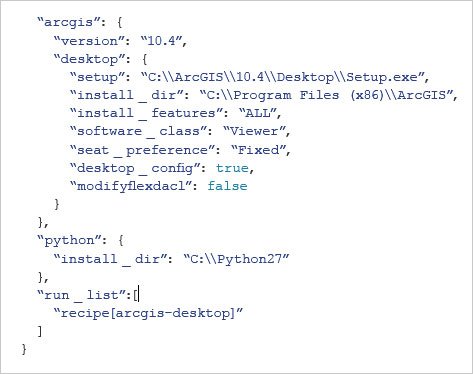 If you don’t have ArcGIS installed on a laptop or PC, you might want to try the simple recipe shown in Listing 5 for installing and authorizing ArcGIS Desktop.